On the occasion of its 40th anniversary, Škuc Gallery will present three shows reflecting its past and present through re-addressing some of art’s persisting questions. The first of these exhibitions is entitled Institution. A Case Study and tackles the inherent productivity of the institutional through a particular juxtaposition of two past projects. These projects occupy radically opposing ends of the possible interventions in the gallery space: one is an example of a closed gallery, the other of an empty gallery space. 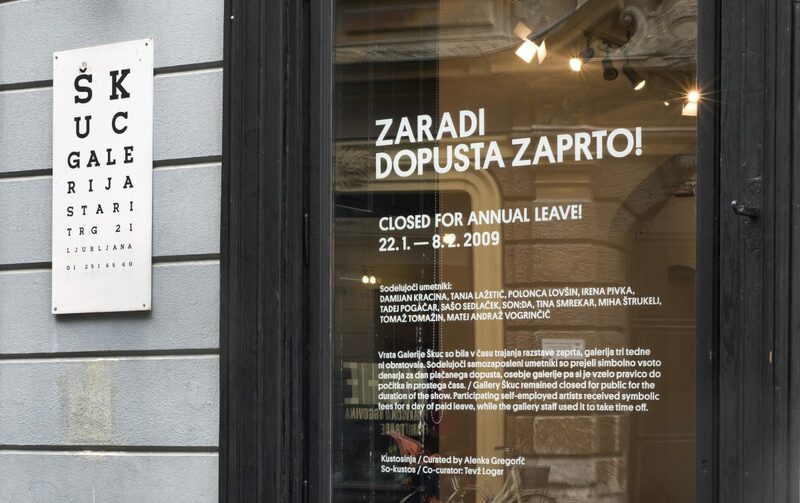 The first »case« is a project curated by Alenka Gregorič, the then artistic director of Škuc Gallery, who in 2009 »opened« a show entitled Closed for annual leave by closing the gallery for the duration of the show and sending the participating artists on paid leave. 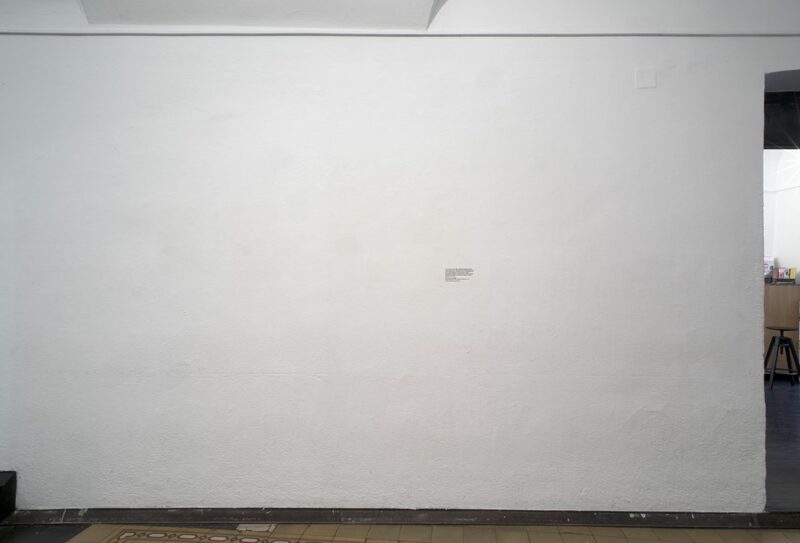 The other, Viktor Bernik’s intervention in the now closed Mala Galerija, revisited the long tradition of emptied exhibition spaces: the artists left the gallery empty and its doors, facing one of the city’s busiest streets, wide open at all hours. Our case study revisits both projects and juxtaposes them, but also adding an intermediary between the two. The »intermediary« work that enables the coexistence of the two projects, each on its side of the gallery outer walls, is derived from Nika Špan’s 2015 intervention from the soon-to-be-demolished Franciscan monastery in Düsseldorf. Using the built-in serving hatch which connecting the monks’ refectory and kitchen, which opens from both rooms enabling passing the dishes between them, Špan connected the doors of the serving hatch with wooden sticks, so when a visitor opened the door on his side, the door on the other side closed. The same mechanism is now applied to the gallery’s main entry: when a visitor opens the door trying to enter, another door from the inside shut in his face. 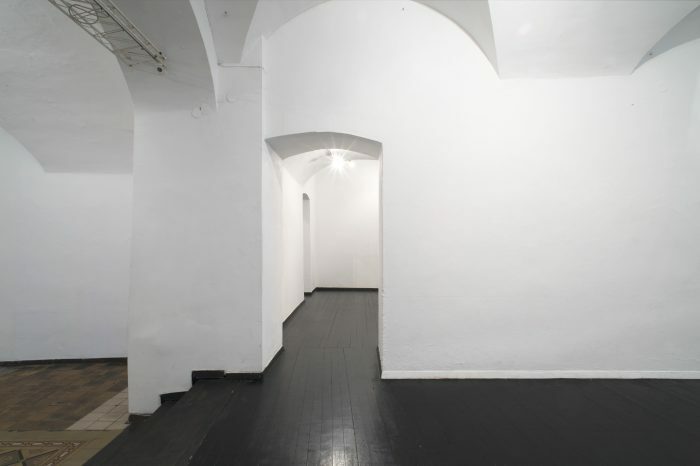 The gallery is thus simultaneously open and closed, enabling the functioning of both Gregorič’s and Bernik’s exhibition projects: one insisting gallery remains closed while the other keeping it open. 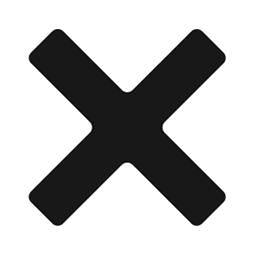 What this new constellation produces is a new situation, a result of a reactivation of three separate projects which have been extracted from their original context and used as references. The spatial dynamics between the two exhibition projects, regulated by the door mechanism, puts the emphasis on the issue of the border, the productivity of the institutional membrane as the constitutive moment for the experience of art. The juxtaposed projects and their intermediary produce a situation that spins the positions since it implies the interchangeability of the two sides, which is made acutely aware by the paradoxical presence of the door mechanism. Institution. A Case Study is, therefore, a meta-exhibition that reiterates the original projects as quotes and in that way strives to continue and further develop some of their conceptual points in terms of reflecting the institutional. By focusing on the limit and the exchangeability of spaces (and positions; of curators, artists, visitors) as well as by referring to rather than re-enacting past exhibition projects, the show entails a different, “side” entry point. The exhibition thus does not exhibit but acts as a setting which some of the participating artists and other invited guest will respond to. Viktor Bernik (1971, Ljubljana) is a Slovenian artist. He lives and works in Ljubljana. He studied at the Academy of Fine Arts in Ljubljana, where he did his MFA and has studied one semester at IUP Indiana University of Pennsylvania. In his practices Bernik tackles the uneasy junctions of art and the everyday, as well as issues of social space and ways in which art enters it. 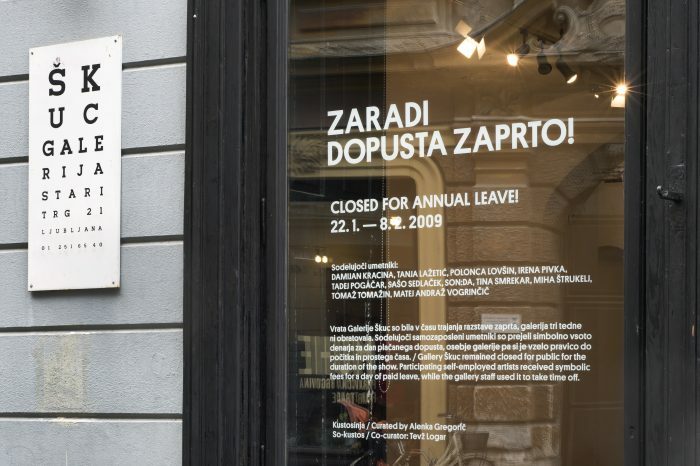 He participated in numerous exhibitions both in Slovenia and abroad, such as the 30th Biennial of Graphic Arts in International Centre of Graphic Arts in Ljubljana (2013), The Present and Presence in MSUM, Museum of Contemporary Art Metelkova in Ljubljana (2012), Untitled Project in Mala Gallery (Moderna Gallery) in Ljubljana (2009), Museum on the Street, in Moderna Gallery Ljubljana (2008), The New Ten in Kunsthaus, Vienna, Austria and in MKM Museum Küppersmuhle, Duisburg, Germany (2004) and many others. Alenka Gregorič is an art historian, curator and writer. 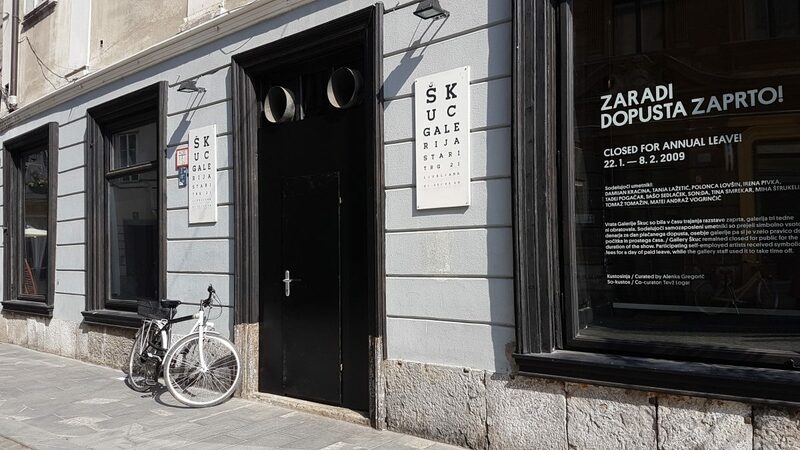 Since July 2003 till 2009 she worked as artistic director of Škuc Gallery, Ljubljana, curating, organizing and co-ordinating all the program activities. 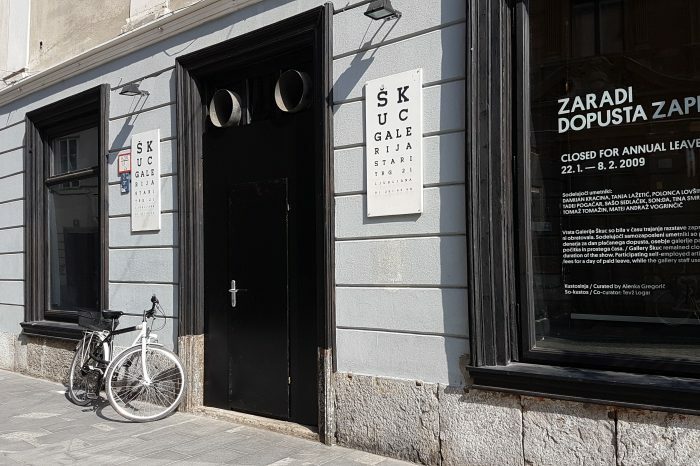 From 2009 she has been the artistic director and curator at City Art Gallery Ljubljana and Tobacco 001 (both part of Museum and galleries of Ljubljana). In addition to curating exhibitions in Slovenia and abroad she has written numerous essays, reviews and articles for various art publications. She curated a group exhibition Symptoms of Society at the Guangdong Museum of Art in China (2017), she was a curator of Slovenian pavilion at Venice biennial (2009) and co-curator of 28. Graphic biennial Ljubljana (2009), also she co-curated the 52.October salon in Belgrade (2011). Nika Špan is one of Slovene most well-known mid-generation artist. After finishing her studies at fine arts academies in Ljubljana and Dusseldorf, Špan developed a particular, conceptually charged approach to institutional critique, building upon creating new modes of communication between the artist, spectators, and spaces. She took part at numerous exhibitions in Slovenia and abroad, such as Crises and New Beginnings. Art in Slovenia 2005-2015, MSUM, Ljubljana, 2015), 30th International Biennial of Graphic Arts (Moderna Galerija, Ljubljana, 2013), Manifesta 3 (Moderna galerija, Ljubljana, 2000), Zero Gravity (Salon 3, London, 1999), Publi©Domain (Graz, 1999); 1st, 2nd and 6th Triennial of Contemporary Art in Slovenia (Moderna Galerija, Ljubljana, 1994, 1997 in 2010).